The province of Hubei is believed to be one of the birthplaces of the Chinese people. It is home to some of the oldest minority groups, including the Dong, Tujia and Miao groups. Known for its hot and humid summers, bright autumns and dry winters, Hubei draws many tourists year-round. Locals from Hubei, also popularly but unofficially referred to as the Chu people, have left their cultural heritage throughout Hubei: enchanting grottoes, old towers, historic city remains, grand mausoleums and residences of the nobility. There’s an interesting sight in the Hubei Provincial Museum: the heaviest musical instrument in the world, which was found in the Tomb of Marquis Yi. The set of 65 massive bronze bells weighs a total of 2,567 kilos. 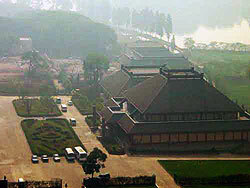 Other notable Hubei province sites are Jingzhou, the ancient city were some Three Kingdom battles were fought, the Yangtze Three Gorges Dam Project, and the national reservation of Shennongji.